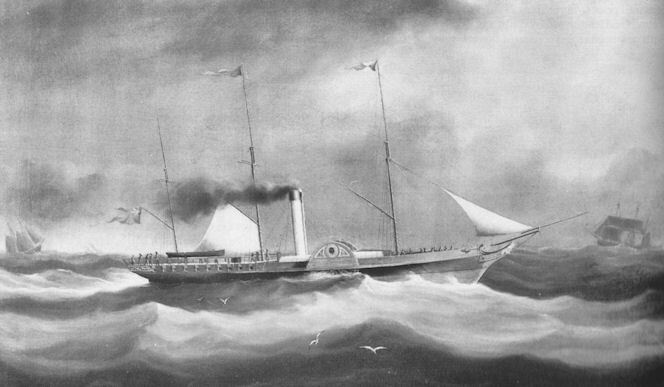 Jupiter - The North of Europe Steam Navigation Company. Built by: John Scott & Sons. Machinery: Two cylinder engines by Scott, Sinclair & Co., Greenock. 210 ihp. 9 knots. Other info: The first ship fitted with a series of pipes extending all over the ship for the purpose of extinguishing fires on shipboard. History: Built for The St. George Steam Packet Co., Dublin. 1844. Sold to Cork Steamship Co., Cork. 1847. Sold to James Hartley (a director of P & O). 17th June 1847. Charted by P & O. 8th January 1848. Sold to P & O. 21st June 1852. Sold to W. S. Andrews, London. 22nd October 1852. Arrived at Lowestoft, Captain Munroe, from Tonning, and sailed again. 4th December 1852. Due to sail in a few days time after undergoing repairs and decorations and will leave Lowestoft for Grimsby. Purchased from the Northern Steam Packet Company. 1856. Sold to The North of Europe Steam Navigation Company. 26th July 1856. Arrived at Lowestoft, Captain George Hart, with a cargo of 198 bullocks, 178 sheep, and 10 casks of butter. 29th July 1856. Sailed from Lowestoft for London, then to Flensburg. 18th August 1856. Arrived at Lowestoft from London, Captain G. Hart, for coal and sailed for Tonning with a general cargo. 1857. Sold to H. Castle, London for £1,250. 1862. Sold to be broken up.